We laugh in the rain. People are leaving, in between the weather, the wind, and the sun itself falling below the horizon. We stand there for a moment longer, watching the sunset pink fade to twilight lavenders and blues. This is my first adult Thanksgiving. I spent a Thanksgiving without my family, and the day passed in a breathless whisper. It was barely there. This year won’t be like that. This will be Thanksgiving, with a capital T, and my family won’t be there to plan it. I won’t be a willing participant in what happens around me. I will plan. Co-planning it, really, with R and two friends of his. R is supplying the tables, the chairs, the dining room, and some of the kitchen space–others have offered their kitchens. Two of his friends, and maybe a third, were delighted to get in on cooking. It’s not -my- Thanksgiving, in that it’s at my house. I will likely be cooking a minority of the food. Still, I feel like this is my first Thanksgiving. We’re going to have a turkey. 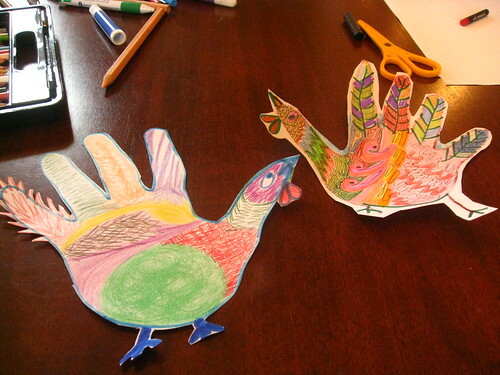 And not just a hand turkey cut out of construction paper, though there will be those too. I’ve been a vegetarian for more of my life than I have not been one (I’m twenty-four, for those of you keeping track)–and this includes the (combined) year I took off while I lived in Asia and prepared for living in Asia. People I’ve talked to have questioned my decision for deciding this, even though I’m not the only one planning the event. I suspect I could lower the iron cleaver and declare that no animals will have been harmed for the creating of this Thanksgiving, but I won’t. There will be green bean casserole and mashed potatoes with whole milk and butter, pumpkin cheesecake and whipped cream, coffee and tea with half-and-half. There will be corn pudding with egg in it. There will be a turkey. If I was having a day even dominated by vegetarians, I would push for the full vegan experience. However, as far as I know, I am the only person there who does not partake in animal products. (I’ll be honest, if I was going to my aunt’s for Thanksgiving, I’d be eating that green bean casserole even knowing it was loaded with dairy. I’d feel bad about it later, but I would eat it and enjoy it because Thanksgiving is about family.) Even though for several of the participants, it will be their first Thanksgiving, they are omnivorous and will happily eat turkey. I am pretty sure my only right to use this is Fair Use. It is exempt from my CC-BY-SA license. Click on the image to see the Wikipedia argument for Fair Use. The culture of Thanksgiving is about the shared experience of being connected. We make that more literal by sharing food. To remove someone from this–from the eating–is to remove them from your family and your culture. I want to share as much of where I come from–of my aunt’s green bean casserole (can you tell how much I love that stuff?) and my mom’s cheesecake recipe–with these people and bring them into my culture. As someone who cannot remember the last time she ate turkey, it is still a part of my culture as it is part of being an American. 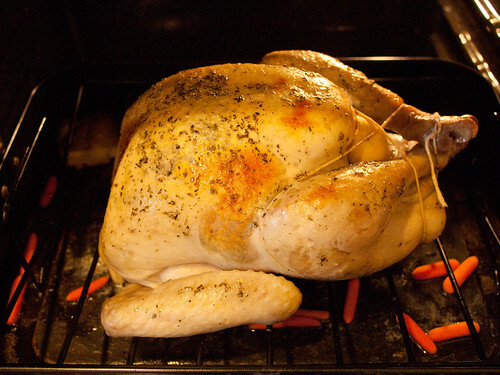 The image of a Thanksgiving dinner includes a turkey, and even vegetarian meals try to simulate the experience. They understand the cultural necessity of that centerpiece of the table. Or they just like the challenge. I know I often do. There will be lots of vegan friendly food. I’ve been heartily inspired by Vegan YumYum’s Thanksgiving menu from 2008. But that’s not -Thanksgiving-. That’s tasty, that’s fall food, but Thanksgiving is my aunt’s white ceramic dishes holding vegetables. Napkin lined wicker baskets full of food. Candles and wine. A turkey. And leftovers. I haven’t told the British about those yet.